"How was your day today?" It's a customary dinner-hour question. In your house and in mine - and houses all over the world - family members take turns sharing highlights (and sometimes lowlights) of their days. These details help us better understand the trials and joys that occur in the hours that we spend apart. When this question is asked around our dinner table, Elsa can use her PODD book to share (see below for pictures of two different PODD styles, and here's a post I did about PODD). While PODD is a great communications system, one of its shortcomings is immediacy. Getting to what Elsa wants to say takes navigation, patience and time. 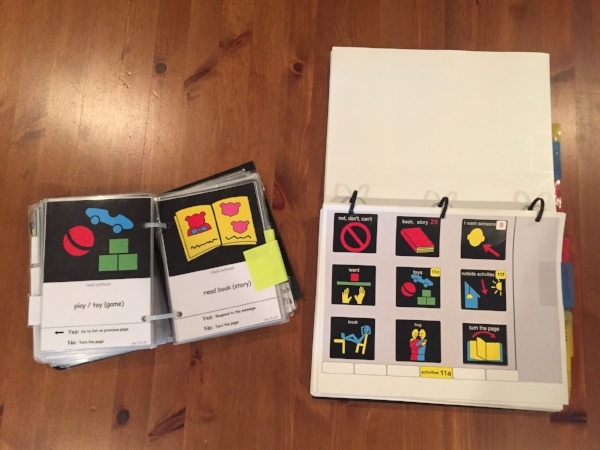 Elsa's new classroom teacher and speech therapist made a great suggestion recently: Why don't we record details about Elsa's day onto a BIGmack switch, so she can share specifics with you? What is a BIGmack, other than a cheeseburger? 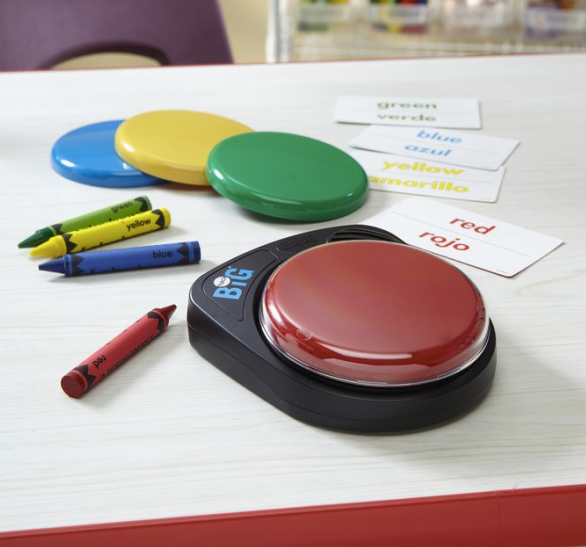 A BIGmack switch is a large colored button - activated by simple touch - that can be programmed to deliver recorded messages. Some switches enable you to record one message, while others enable a sequenced message. Those smiles! Elsa LOVES being in control of touching the button and hearing a voice that represents her experiences. One of our goals for Elsa is "total communication." That means we want her to be as versatile as possible. We want her to know that a picture of a dog, and a cartoon of a dog, and an actual dog at the park are ALL dogs. In this same way, Elsa knows she can speak with PODD or a switch, and that both are communication. This flexibility has always been one of Elsa's strengths. We are in the lengthy paperwork process of trialing some new tablet-style communication devices through Easter Seals. But until these complex pieces of equipment are in hand, the BIGmack switch is giving Elsa another great way to express herself.